Windmoor Healthcare provides compassionate treatment to adults suffering from a behavioral health disorder or substance use issues. Our inpatient and outpatient programs are individualized to help every patient achieve mental wellness and long-term sobriety. This 28-day inpatient program can help you overcome alcohol use disorder, substance use disorder, compulsive gambling, or co-occurring disorders. Our intensive outpatient and partial hospitalization programs offer intensive, structured, and therapeutic services to patients who do not need 24-hour care. You can receive rapid stabilization for an acute state of crisis through this intensive, short-term program conducted in our highly structured, clinical environment. Take advantage of an extensive network of psychiatric aftercare services that can help you maintain stability and avoid relapse after leaving our care. This inpatient program addresses the physical and emotional problems faced by many older adults and helps them attain their highest level of function. Military members and veterans can receive specialized care to help them achieve behavioral wellness and successful reintegration into the community. Our inpatient programs are designed for patients with substance use or mental health disorders so severe they require 24-hour care at our live-in facility. We help them achieve stability and long-term sobriety. Patients that require less intensive care or a step down from inpatient care can receive outpatient or partial hospitalization treatment at one of our outpatient facilities located in Clearwater, Tampa, or St. Petersburg. Clinical professionals looking to refer patients to a dependable behavioral health facility in the Tampa Bay area can trust Windmoor Healthcare. We’re licensed, accredited, and dedicated to providing the best possible care to all patients. Windmoor Healthcare is a designated Baker Act receiving facility under the Florida Mental Health Law. This means we accept involuntary patients if they are a serious danger to themselves or others. "I've been to a few rehabs but when I came to Windmoor I was upset about everything. As time went on, I began to understand. Now I wouldn't trade my time with my therapist for anything. She was awesome! I think she saved my life and many others. I can't say enough good things about her and Windmoor." If you’re looking for an opportunity to build the career of your dreams and join a team of professionals passionate about helping patients, Windmoor Healthcare is the place for you. Learn about the admission process patients go through when entering the facility. This includes a mental and physical assessment to determine the right level of care. Windmoor Healthcare is dedicated to helping individuals with a behavioral health or substance use issue. Get to know our story and approach to treatment. Stay connected with groups like Alcoholics Anonymous, Gamblers Anonymous, and Narcotics Anonymous to know of upcoming meetings and events. We are accredited by The Joint Commission and uphold the highest safety and patient care standards. As a proud supporter of the National Action Alliance on Suicide Prevention, Windmoor Healthcare provides education and resources to the communities we serve. Watch our video to learn more. We want all patients to be comfortable and at ease while under our roof, which is why our facilities are designed with care and healing in mind. Windmoor Healthcare's Lobby is centrally located and provides a comforting atmosphere. The living space at Windmoor Healthcare is designed for the comfort and relaxation of our patients. Windmoor Healthcare has a pool for a relaxed and comfortable atmosphere. 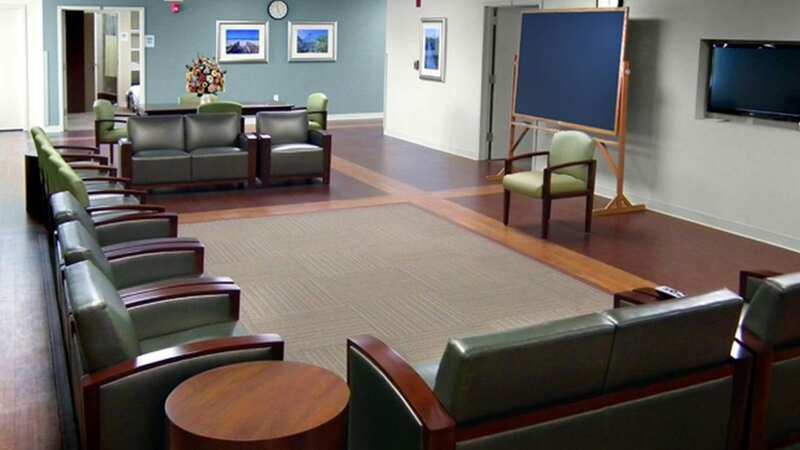 Windmoor Healthcare’s meeting room is designed to help patients and healthcare professionals communicate and socialize. Windmoor Healthcare’s dining room is a comfortable space where patients can enjoy meals and the company of others.